The Senate health care bill is scheduled to be released sometime today, and we're hearing that conservatives in the Senate are already concerned that the bill is nothing more than cosmetic surgery, not the “root and branch” repeal promised by Senate Majority Leader Mitch McConnell. The Senate bill would fund the ACA's cost-sharing subsidies — a key sticking point for insurers — through 2019. It also would provide a four-year reinsurance program to help states stabilize their marketplaces. Subsidies would be available to people making up to 350 percent of the federal poverty limit — down from 400 percent under the ACA. That includes people under 100 percent of the federal poverty limit, who currently don't receive subsidies under the ACA (the law assumed this population would be on Medicaid). The House's optional state waivers probably will not be included in today's draft bill. The House bill allowed states to waive the Affordable Care Act's essential health benefits and its ban on charging higher premiums to sick people. But the Senate gives much greater flexibility to the ACA's existing state waivers (for wonks, 1332 waivers), and expedites their approval. The ACA laid out strict conditions for what the waivers could do, and the GOP bill would loosen these — which could be a different means to the same end reports Axios. Axios reports Senate aides are fairly certain they won't be able to create a new tax credit for people buying on the individual market that includes the pro-life Hyde amendment, per Senate budget rules. The backup plan is to leave the current ACA premium subsidy structure in place, but to scale it back. However, the bill will also include an insurer stabilization fund, like the House bill. This probably will be funneled through the Children's Health Insurance Program, which does contain the Hyde amendment. Thus the stabilization fund can't be used to cover abortions. Since most plans will use the stabilization fund, they won't be allowed to cover abortions — a roundabout way of including pro-life protections. What's unclear is whether today's draft will create a new tax credit structure with Hyde amendment protections, which will probably be stripped out before the vote on the bill, or whether it'll skip straight to including the revised ACA subsidy structure. Axios reports nothing new expected in today’s draft. Still a lower growth rate than the House beginning in 2025 and a three-year glide path for phasing out Medicaid expansion. It will also let states choose the base amount for their per capita caps based on eight consecutive quarters. Senate conservatives have still not seen the bill, but based on the rumors and leaks it is not an Obamacare repeal bill. At best, it does cosmetic surgery on Obamacare, but it certainly does not repeal it. The problem is that if this bill fails because of conservative opposition it will be deemed a President Trump failure, or worse yet, a failure by Senate conservatives, not a Mitch McConnell – Paul Ryan failure. Our friends at Tea Party Patriots have put out a call to action that is right on the money as far as we are concerned. They have asked conservatives to call their Senators TODAY to tell them they want a bill with the three "C's" of meaningful healthcare reform front and center in mind when repealing Obamacare. The three C's are: the Constitution, the cost of Obamacare, and competition. What’s more, they have a great set of taking points that you can use to help you with your call. The Capitol Switchboard is (1-866-220-0044) we urge you to call your Senators, tell them the bill as described above is at best cosmetic surgery, not the full repeal of Obamacare that Mitch McConnell and the Senate Republican leadership promised. Our nation simply cannot afford Obamacare. The healthcare law adds trillions to our nation’s debt. Obamacare’s mandates and regulations have driven up health insurance costs, and they must all be repealed. True healthcare reform will uphold the Constitution, protect individual liberty, and not put government between doctors and patients. In replacing Obamacare, Congress must first look to the Constitution for guidance. Obamacare gives bureaucrats and other unelected officials in Washington, DC too much power. The law created more than 150 new agencies, boards, and commissions made up of unelected people who are not accountable to us! Obamacare’s “individual mandate” is an attack on individual liberty. The individual mandate requires all citizens to buy government-approved health insurance or pay a fine to the IRS. The Senate’s reform bill must rein in – not expand! – the federal bureaucracy. Submitted by redbeardrelics on Thu, 06/22/2017 - 13:14. I think you summed it up perfectly in your last sentence "The Senate’s reform bill must rein in – not expand! – the federal bureaucracy.". The subjects of "healthcare & insurance" have been debated continuously for the last 8 plus years, or actually since 1993 with the Hillarycare debacle. Unfotunately, and alarmingly, I have not heard anyone tell the real truth about these subjects in the last 25 years. So, let me be the one to twerk everybody off with the real truth. 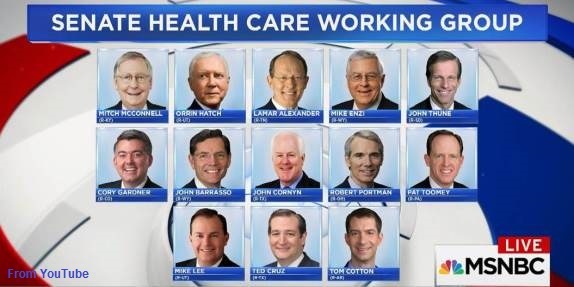 I am in my mid 50's, and I am old enough to remember the days when "healthcare" was affordable to everyone, and no one wined about not having "healthcare". When I was young I "cared" about my health, as did my parents, siblings, grandparents, cousins, nieces, nephews, neighbors, teachers, bus drivers, pastors etc. If someone didn't care about their own health, shame on them. If someone was such a disgusting piece of work that their own families and friends didn't care about their health, then certainly that was not someone that I or we should care about. The costs associated with caring for one's own health have risen dramatically and exponentially in the last 50 years. The underlying and overriding reason for this spike in costs has been the proliferation of "health insurance". Health insurance is the cause of the problem, not the solution! The whole reason Obama and the Libs, and now the Rino's, want to be in the health insurance racket, is because it is such a lucrative racket. The politically incorrect truth is that somewhere between 90%-95% of people who purchase "health insurance" are getting royally screwed, because they will pay into the policy far more money than the policy will ever pay out on their behalf. The other 5%-10% of people will end up getting way more money paid out on their behalf, than they will ever pay into their policies. There is only one thing in this world that is worse than being one of the 90-95% of people that are being screwed by "health insurance" policies, and that thing is to be one of the 5-10% who are doing the screwing, and are dumbed down into thinking it is Ok to take other peoples monies as long as they can take the cowardly way out and not do it in person, but rather while standing behind an insurance company or government who acts as their go between in the scam. Far worse is being one of the 5-10% who are corrupted into thinking that maybe crime really does pay as long as it is their name on the check that comes from the insurance company or government, or it is their bank account where the money gets direct deposited at the first of the month. It is time we eliminate all these church charity re-distribution schemes from our government. No more religious guilt trips about feeding the hungry, housing the homeless, clothing the naked, educating the ignorant, or healing the sick. I cringe whenever I hear some bleeding heart politician, conman, or commentator whine that if we repeal Obamacare, 10 years from now we will have 20 million people in the US who are not enrolled in an insurance policy. The correct response should be, "thank God", both literally and figuratively. Wouldn't it be great if 10 years from now we had 20 million more intelligent people in this country, and 20 million less ignorant people? Wouldn't it be a blessing in the true sense of the word if 10 years from now we had 20 million more honest people in this country, and 20 million less corrupt? Submitted by Ckm4cuqB2q on Thu, 06/22/2017 - 12:57. The US Congress is incapable if doing what is right and good. What is being planned, healthcare, is NOT being explained to the American People. Congress should not vote on anything anymore, the people should.